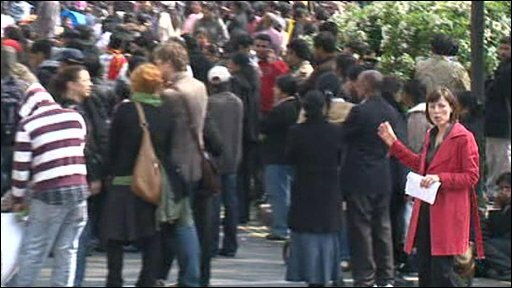 Tamils staging an ongoing protest in central London have blocked roads around Parliament Square as they demand a ceasefire in Sri Lanka. 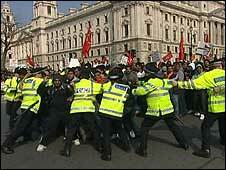 The Metropolitan Police said about 3,500 people had gathered at Parliament as MPs returned after Easter. The demonstrators began rallying two weeks ago over the conflict between the Sri Lankan government and the Tamil Tigers separatist group. Protesters want the UK to end the war in Sri Lanka - a former British colony. The numbers at the protest swelled from hundreds to thousands overnight on Sunday after news broke that at least 25,000 civilians had fled fighting in a Tamil Tiger-held area in the north of the country. Suren Surendiran, of the British Tamils Forum, said those at the demonstration "did not want words any more" and he called on the UK government to take the issue to the UN Security Council in order to implement a ceasefire. "This is a peaceful demonstration. This is about brothers and fathers and sisters being killed. I know people who have lost 15 members of their family," he said. "These are people exercising their democratic right when people across the world are having their human rights trampled on." Among the protesters in Parliament Square is Prarameswaran Subramaniam, 28, who has lost several family members in the conflict and has gone on hunger strike. A second man, Sivatharsan Sivakumaraval, 21, agreed to call off a fast last week. Lying on a bed in a makeshift tent, Mr Subramaniam said he was on his 13th day without food. "This is something I chose to do. I want to do whatever I can to highlight the plight of the Tamil people who have been discriminated against for the past 60 years," he said. Mr Subramaniam pledged not to eat again until a ceasefire was agreed. The Sri Lankan government has rejected calls for such a ceasefire, arguing it would give the Tamil Tigers - a proscribed terrorist group in many countries, including the UK - time to regroup. The Tigers - or Liberation Tigers of Tamil Eelam - are fighting for a separatist state in the north and east of the island. On Sunday, Gordon Brown sent a special envoy to the United Nations in New York for "urgent" talks on Sri Lanka. Des Browne will work to try to secure a ceasefire between government forces and Tamil Tiger rebels fighting in the north of Sri Lanka. Some 100,000 civilians remained trapped in the area and Mr Brown's spokesman said the prime minister wanted them to be allowed to leave. "The prime minister is deeply concerned by the current conflict and there should be an immediate ceasefire," he added.